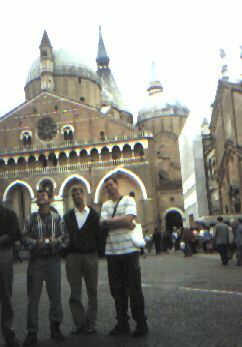 (MATT') The next day we went to Mass at St. Anthony's in Padua and ended up catching the end of 9 a.m. Mass, the whole 10a.m. Mass, and the beginning of high Mass at 11:30 which had 121 Franciscan priests con-celebrating. Each Mass was packed to the gills and each one was probably the largest Mass I'd ever seen. It was very nice to see a church so full. However, the quantity of people in the church and the fact that they were Italian made getting to Communion similar to a football game, but we all made it. Note: If ever in a similar situation, step in front of the opponent and use your hips to box them out and squeeze in front of them. After Mass, we wandered around town, did some gift shopping, and took off. We weren't sure exactly where we were going. We knew we were heading on to the Alps. We ended up heading for Switzerland by way of Austria and once we made it to Austria, decided to stop at Hall, a small town outside Innsbruck. We ate in Innsbruck (little sandwich and piece of pizza) and found a campground which I pronounce Kranebitten. We were looking for a laundramat since the tent was soaked as well as most of our clothing (not to mention that they were filthy as well,) but pulled into Kranebitten since we saw no laundromat and no hostel readily available. I asked the guy at the campsite if they had any bungalows or cabins or patios or anything we could use to get out of the rain. He laughed and said trees, not what I had in mind to say the least. Before leaving, on a long shot, I asked if they had laundry and he said yes. I was very surprised and asked immediately, "Are they open?" --yes, again. But before I even began to hope at all that we might be saved, I asked, "Do you have dryers?" (The reason behind this question is that we had seen laundry services without dryers our entire trip but we had yet to see a dryer.) To my shock, surprise, and delight, he said yes. I asked how much, willing to pay nearly anything and he said the dryers are free but the washers cost 20 shilling ($2). More great news. Turns out that both the washers and dryers were free: I don't think that they were supposed to be. We totally dismantled the tent and put it into the dryer. Then we all did laundry for free for the next 15 hours. We ended up going to the camp store around 10 p.m. for burgers and fries (which were delicious.) Then back to the laundry. Sam finally finished the last leg of the laundry marathon the next morning by taking Chris' clothes out of the dryer and drying his.